The reputations of scandalous parents have dogged the three Summerfield sisters and their half-brother their whole lives. All they desire is success, respectability—and love. But somehow scandal has a way of catching up to them. Genna Summerfield first glimpsed him out of the corner of her eye, a distant horseman galloping across the land, all power and grace and heedless abandon. A thrilling sight. Beautiful grey steed, its rider in a topcoat of matching grey, billowing behind him. Horse and rider looked as if they had been created from the clouds that were now covering the sky with grey. Could she capture it on paper? She grabbed her sketch pad and charcoal and quickly drew. It was no use. He disappeared in a dip in the hill. She put down the sketch pad and charcoal and turned back to painting the scene in the valley below her, her reason for sitting upon this hill in this cold December air. How she wished she could also paint the galloping horse and rider. What a challenge it would be to paint all those shades of grey, at the same time conveying all the power and movement. The roar of galloping startled her. She turned. Man and horse thundered towards her. Drat! Was he coming to oust her from the property? To chase her from this perfect vantage point? Goodness! He galloped straight for her! Genna backed away, knocking over her stool. The rider pulled the horse to a halt mere inches away. “I did not mean to alarm you,” the rider said. “I thought you would run me down!” She threw her paintbrush into her jug of water and wiped her hands on the apron she wore over her dress. He was a gentleman judging by the sheer fineness of his topcoat and tall hat and the way he sat in the saddle, as if it were his due to be above everyone else. Please do not let this gentleman be her distant cousin, the man who’d inherited this land that she once—and still—called home. She looked into his face. A strong face, long, but not thin, with a straight nose that perfectly suited him, and thick dark brows. His hair, just visible beneath his hat was also dark. His eyes were a spellbinding caramel, flecked with darker brown. She would love to paint such a memorable face. Not her cousin, then. She breathed a sigh of relief. Some other aristocrat. She knew Lord Penford was her cousin, but that was about all she knew of him. Just her luck. This man was his guest. The smile on his face froze and she had her answer. Of course he’d heard of her family. Of her late father, Sir Hollis Summerfield of Yardney, who lost his fortune in a series of foolish investments. And her mother who was legendary for having many lovers, including the one with whom she eloped when Genna was almost too little to remember her. Who in society had not heard of the scandalous Summerfields? “Then you used to live at Summerfield House.” He gestured to the house down below. Genna was not so certain. After her father’s death, Lord Penford had been eager for Genna and her two sisters to leave the house. “Where are you bound?” he asked. Genna’s oldest sister married the ancient Lord Tinmore for his money so Genna and her sister Tess and half-brother Edmund would not be plunged into poverty. So they, unlike Lorene, could make respectable marriages and marry for love. Genna had not forgiven Lorene for doing such a thing—sacrificing her own happiness like that, chaining herself to that old, disagreeable man. And for what? Genna did not believe in her sister’s romantic notions of love and happily ever after. Did not love ultimately wind up hurting oneself and others? The wind picked up, rippling her painting. She unfastened the paper from the easel and carefully placed a sheet of tissue over it. She slipped it in a leather envelope. “I painted a memory, you might say.” Or the emotion of a memory. The wind gusted again. She turned away from it and packed up hurriedly, folding the easel and her stool, closing her paints, pouring out her jug of water and wrapping her brushes in a rag. She placed them all in a huge canvas satchel. “How far to your home?” Rossdale asked. She almost laughed. 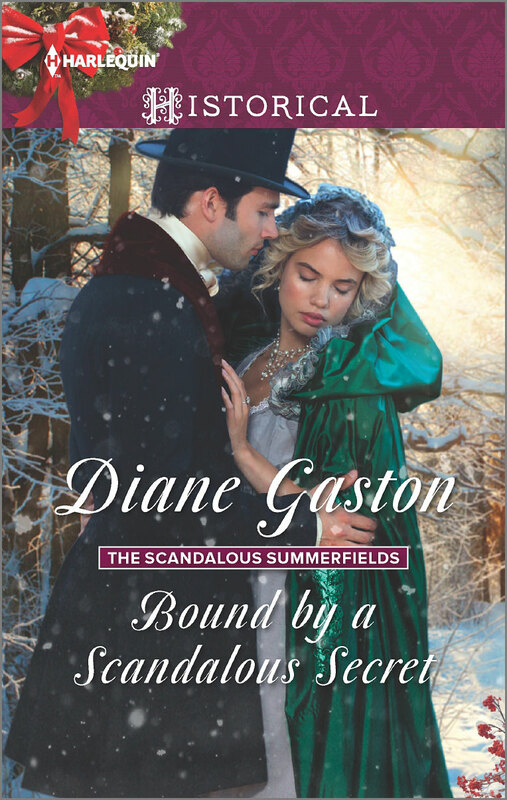 Did he not know what could happen if a Summerfield sister was caught in a storm with a man? Although Genna would never let matters go so far, not like her sister Tess who wound up married to a man after being caught in a storm. Why not risk a ride with Rossdale? Genna, the heroine of Bound By A Scandalous Secret, is an aspiring artist who wishes to make her living with her art. It is a daunting task. In that era, there were professional women artists, but they were few and far between. In the late 18th Century, Angelica Kauffmann (1741-1807), a Swiss artist, was a successful portraitist, landscape and decoration painter, but she was renowned as a history painter. She was the daughter of a skilled but poor Swiss painter who recognized her talent by age twelve. Painting in Rome, Venice and London, she was one of the two women artists who were founding members of the Royal Academy in 1768. Kauffmann scandalized the art world by painting a self portrait of herself smiling and showing her teeth. This was simply not done! Élisabeth Louise Vigée Le Brun (1755-1842) was a French painter who, for a time, was the official portraitist of Marie Antoinette. Le Brun, another artist’s daughter, grew up among artists in Paris. She fled France during the French Revolution, continuing her career in Italy, Austria, and Russia, before returning to France under Napoleon. She also traveled to England and painted many portraits there, including one of my favorites of Emma, Lady Hamilton. Maria Cosway (1760-1838) was born in Italy of an English father and Italian mother. Her artist’s career started in Italy where she studied under Italian masters. She moved to England in 1779 and was helped to become a member of the Royal Academy by Angelica Kauffman. She married miniaturist Richard Cosway who was ten years her senior and who initially forbade her to paint, because women artists were considered scandalous. After one child the Cosways separated and Maria wound up in Napoleonic France where she met Thomas Jefferson, who fell in love with her. They corresponded for the rest of their lives. When I visited Chatsworth, I saw this magnificent painting of Georgiana, Duchess of Devonshire, by Maria Cosway. My heroine Genna had certainly heard of these successful women artists, but she also knew of the stigma of being a woman artist who is paid for her work. More acceptable in English society were women who painted as a hobby, but not for pay. Genna had never actually met another artist, though, let alone another woman artist. In the book, I wanted her to meet a real woman artist of the time period. My research led me to Amelia Long (1762-1837). Amelia, nee Hume, was the daughter of an amateur artist and she studied under watercolorist Thomas Girtin, a friend and rival of Turner, and also of Henry Edridge, a painter of landscapes, miniatures, and portraits. She painted landscapes that were exhibited at the Royal Academy. Amelia married Charles Long, a politician and art connoisseur who was a friend of William Pitt and an art advisor to the Prince Regent, who later became George IV. In 1826 Charles became Baron Farnborough. In Bound By A Scandalous Secret, Genna toured Carlton House, the extravagant residence of the Prince Regent. In my first version, I just made up a fellow to be her guide to the house, but when I discovered that Charles Long advised the Regent on artistic matters, he was perfect for being her tour guide.